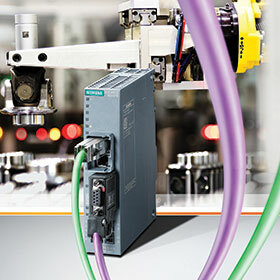 Siemens has extended its portfolio of industrial routers with the Scalance M804PB, which allows existing machines and plants to be connected to Ethernet networks via Profibus/MPI (multi-point interface). Users can also easily and economically connect older machines and plants directly to the Sinema Remote Connect management platform for remote networks. Secured communication takes place via a VPN tunnel which can be easily configured and administered via Sinema Remote Connect. The Scalance M804PB extends the proven Scalance router product line and provides a consistent remote maintenance concept for existing and new plants. This makes it suitable for companies in the manufacturing industry such as mechanical equipment manufacturers/OEMs, as well as for companies in the automotive, food and beverage, and chemical and pharmaceutical industries. The device has integrated TIA Portal cloud connector functionality. This allows users to access existing Profibus units from centrally administered engineering tools such as the TIA Portal or Step 7. The Scalance M804PB is a Profibus/MPI router for private, wired networks even with existing two-wire cabling. In addition to a Profibus/MPI connection, it also has two RJ45 interfaces in the form of a fast Ethernet two-port switch. It also has a C-plug/key-plug slot. The router supports VLAN, firewall/VPN (IPsec)/NAT, OpenVPN (as client), VRRP/RSTP, and can be configured for CLI and SNMP via web-based management tools. Download and upload data rates of 9,6 Kbit/s to 12 Mbit/s can be achieved on the Profibus/MPI interface. The redundant supply voltage is 24 VDC. Mounting options include wall mounting, DIN rails and S7-300 or S7-1500 profile rails. The Scalance M804PB has the same user interface and comparable performance characteristics as the Scalance M-800 and S615 product line, as it is based on the same firmware. This provides easy handling and compatibility with existing systems (for example, the Simatic portfolio and network management software), while digital input and output allow on-site access control via key switches. Siemens leads manufacturing to the next level of digital transformation.